News from the front desk Issue 421: The new year is finally starting to reveal some shape. From the heartland of the sustainability revolution there seems to be bigger than usual movement in the jobs market, from the managers and footsoldiers right up to the top roles. The job ads in sustainability are as full as we’ve ever seen them. And after a period of what’s probably the most toxic politics in history directed at a particular sector, it’s no surprise some people want to move on and at least get a change of scenery. Among important leaders and shape shifters calling time are Romilly Madew after a massive 14 years leading the Green Building Council of Australia (picking up an AO gong on the way, just this week) and Robin Mellon after three years at Supply Chain Sustainability School and, to be fair, nine years before that with the GBCA. But while these stalwarts and their teams who’ve worked so hard to take an industry from zero to another zero – the goal of zero carbon emissions – there’s fresh blood stepping into the breach. The new entrants will come in with vigour and it’s always welcomed with open arms. There’s nothing like a brain storm from diverse sources to unlock the creative juices. And diversity is one of the biggest achievements of the past 10 years that we’ve been observing. Credit to this amazing industry. In politics too there is a changing of the guard that will bring diversity and with it the potential to dramatically rewrite the landscape. A powerful batch of this new blood is coming from deep within the Liberal heartland itself. Namely a bunch of new and Liberal Party-defecting pollies who are demanding a more socially progressive agenda with a big caveat at the top for climate change action. If you’d been in Adelaide this week or Melbourne, (or Boston where the polar vortex is “wobbling” and spreading south because the warming landmass around it is disrupting its normal stability) you’d understand why the spin is getting stuck in the “won’t wash” cycle. And no amount of scoffing from the entertainment departments of the Murdoch empire and its buddies in radio can deny the reality that the winners in the Wentworth by-election and the Victorian state election both topped their agenda with climate action. Besides too many “small l” liberals also want to reinstate the eponymous philosophy on which their party was based. The result is now an almost daily parade of defectors challenging the hard right’s determination to suppress climate action and clean energy. First were the resignations of elected Lib members from the front bench (Julie Bishop) and from the party (Julia Banks). Last week the highly talented and well-regarded government/planning/infrastructure insider Alice Thompson threw her hat into the ring to challenge former PM Tony Abbott in Warringah. Thompson has huge credentials working on cities in the PM’s office under Malcolm Turnbull and in Infrastructure Australia. She’s also got a strong science and environmental background that she blends with highly developed political skills. 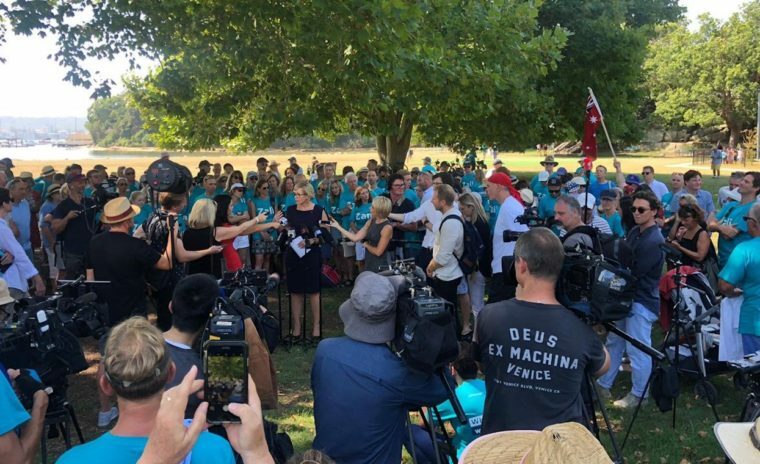 This week the high profile Zali Steggall stepped up, on the strength of four time winter Olympian status, career as a barrister, hundreds of blue t-shirt wearing community groups at her campaign launch, promises from just one former Lib stalwart for a potential $200,000 donation for her campaign, and campaign advisers from Kerryn Phelp’s winning challenge at the Wentworth by-election. But her biggest magic calling card to the electorate is her decision to make climate action top of her agenda, supported by the eminent Professor Tim Flannery who headed the Climate Commission when the Abbott climate sledgehammer was at its worst. The Twittersphere soon outed Steggall as a Liberal with a “coat of climate change” paint, since she opposes most of Labor Party politics. But that won’t worry GetUP! which says it doesn’t care about the parties, it cares about the issues. A spokeswoman from the activist group told us on Wednesday it would respond to what its members want on a policy basis and right now that was to get rid of Tony Abbott. A meeting scheduled for Wednesday night at Warringah had 500 acceptances by Wednesday afternoon to discuss how to do this, she said. Plans include to “doorknock every house in Warringah” and ask people how their values squared with those of the sitting member. UPDATE Friday 1 February 2018:: The story was covered by other media on Friday morning, with an additional note from the group that many of the doorkockers would be traditional Liberal Party voters. This follows a recent poll of 28,000 members who voted to boot hard right politicians from office starting with, in order of preference, Peter Dutton, Tony Abbott, George Christensen and Barnaby Joyce. But that’s not all. Hot on the tail of Steggall, who’s currently blitzing the media waves with a mention in nearly any story about politics right now, comes the hugely well regarded Oliver Yates to challenge energy minister Josh Frydenberg in the seat of Kooyong. Yates is a former and inaugural head of the Clean Energy Finance Corporation and comes direct from the Libs’ heartland; his father William Yates was a Liberal MP. He’s earned the respect of both the climate supporters for standing firm against the onslaught from Abbott to curtail clean energy investments by the CEFC and the finance community for making the CEFC a financial success. And this morning’s news, (Thursday) was that Julia Banks will challenge Greg Hunt in Flinders on the issues we’ve been banging on about. UPDATE: Friday 1 February 2018: Julie Bishop today flags that she will “position herself as an advocate for bipartisan policy on climate change” noting opinion polls show “consistently strong” support for action on climate change. So here you have it: an almighty challenge to the pollies’ intransigence on climate change and clean energy; polls in the US saying 74 per cent of respondents are seriously worried about climate, roughly the same as in Oz and the extremes of weather reinforcing the message and bringing home the fact that time’s up. Kevyn agree with what you are proposing. I follow the same agenda. The urge for ‘climate change action’ plays into the Maurice Strong destructive agenda, particularly that all it does in Australia is make us poorer for zero effect. Much better that we look at the energy efficiency of our buildings and design and build for passive measures. They are all well known, but largely disregarded by the market: for smaller buildings (ie houses) its plan form, orientation, shading, double glazing, wall design, ventilation, insulation. Properly done, few places in Australia would require airconditioning or heating in homes.